Billions of organisms travel through the air, influencing population dynamics, community interactions, ecosystem services and our lives in many different ways. Yet monitoring these movements are technically very challenging. During the last few decades, radars have increasingly been used to study the aerial movements of birds, bats and insects, yet research efforts have often been local and uncoordinated between research groups. However, a network of operational weather radars is continuously recording atmospheric conditions all over Europe and these hold enormous potential for coordinated, continental-scale studies of the aerial movements of animals. The European Network for the Radar surveillance of Animal Movement (ENRAM) is a new e-COST research network aiming exactly at exploring this potential. The main objective of ENRAM is to merge expertise to utilize weather radars to monitor the aerial movement of animals across Europe for a broad range of stakeholders at an unprecedented scale and enable researchers to study the causes and consequences of movement. In this paper we describe the aims of ENRAM in more detail and the challenges researchers will address, provide an overview of aero-ecological studies using radar, and present some of the opportunities that a large sensor network can provide for movement ecology research. Worldwide, billions of organisms of numerous taxa move through the air to disperse to new breeding areas, migrate to seasonally optimal habitats, search for resources and mates, avoid predators and find food, defend territories and much more, in short to meet their requirements for survival and reproduction [1–4]. Studying animal movement can be extremely challenging as organisms are often out of the line of sight of visual observers and technological tools are the only way to study their movements. Continuous miniaturization and technical innovation of devices have resulted in a revolution in tracking aerial movements of individuals; however, the relative mass of these devices is still a major constraint [5–7]. Thus, only a small fraction of species can be tracked with sensors attached to their bodies and within these species only a very small subsample of individuals are tracked, generally on the order of several to tens of individuals per study. Radar provides a complementary tool to study broad scale aerial movements, enabling researchers to study behavioural decisions of organisms, the timing and spatial distribution of their movements, their response to environmental conditions and, something not possible with individual tracking, quantify the temporal and spatial abundance of organisms in the air. Radar has been used to study bird movements since the 1940’s  and insect movements since the 1960’s . However, in recent years, radar ecology has experienced a renaissance with improved sensor technology, specialized radars designed for specific types of ecological research, improved data management and processing capacity, and algorithms for detecting and distinguishing between different biological targets [10–12]. In Europe, operational weather radars continuously monitor atmospheric conditions and are organized in a network (OPERA – Operational Program on the Exchange of Weather Radar Information) to facilitate data exchange and measurements at the continental scale . One of the most promising developments for radar ecology in Europe has been the production of algorithms that successfully extract biological information from weather radars . Until recently, radar ecology studies have been rather localized and scattered geographically across Europe. However, a multi-disciplinary group of researchers has taken action to change this situation. On 21 October 2013, a new four year e-COST (European Cooperation in Science and Technology) Action within the Domain Earth System Science and Environmental Management was launched: ENRAM, the European Network for the Radar surveillance of Animal Movement. In this paper, we briefly describe the aims and scopes of this new research network, highlight some of the recent research and applications related to animal movement using radar, and discuss some of the new opportunities we envisage through this network, which we hope will grow in the coming years. Operational weather radar data provides information about the spatial distribution, density, altitude, general speed and direction of organisms during flight. The radars are increasingly dual polarization systems which also provide information of the shape of the scattering objects. This novel information can greatly improve the ability to distinguish insects, birds, bats and hydrometeors (precipitation) in weather radar data . The data are a unique and extensive source of information for ecological studies that contribute to a better understanding of animal movement. In several countries these data can be accessed for ecological research due to fruitful cooperation between meteorologists and biologists. However, there is the need to harmonize radar measurements and retrieval algorithms to achieve comparable data on a continental scale. The resulting standardized data is essential, in order to validate the results and to develop new algorithms for further differentiation of biological targets. Therefore, the main objective of ENRAM is to foster international and multi-disciplinary collaboration by establishing a European network of researchers with expertise in ecology, ornithology, entomology, meteorology, engineering, mathematics, visual analytics and computer sciences. Currently, 21 different countries are represented in the Action (Figure 1). The network will coordinate existing monitoring efforts, improve biological target identification and promote continental scale monitoring of aerial animal movement for the first time. In order to achieve these aims, numerous challenges will be addressed by the network in the coming years through the activities of four working groups (WG). While each WG has its own particular focus, addressing different technical and theoretical challenges related to radar research, they will work in close collaboration as their objectives are intertwined. 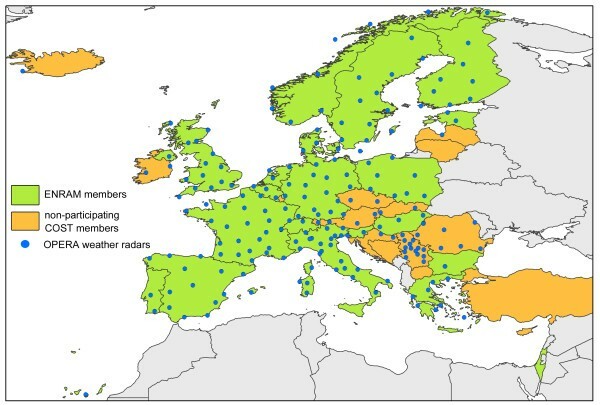 Improving existing algorithms to extract biological information from weather radars, tailoring them to local conditions and applying these algorithms to operational weather radars across Europe will be addressed by WG 1. Improving our understanding of the properties of biological targets that are registered by radar is the main challenge that will be addressed by WG2. This will be done by conducting calibration experiments with multiple radar systems, namely specialized bird and entomological radars in conjunction with operational weather radar. The combination of different specialized sensors will provide essential information needed to improve the classification algorithms developed by WG 1. Most researchers are used to single radar study sites; a new challenge, to be addressed by WG 3, is to effectively visualize and study large scale patterns across multiple radars, and to understand the processes that drive animal movements at synoptic scales. Finally, with information at hand about large scale animal movement patterns, WG 4 will integrate this information in animal movement research across multiple taxa. Geographic distribution of OPERA network radars and countries participating in ENRAM. The 21 countries currently participating in ENRAM (April 2014), e-COST Action ES1305 (green) are: Belgium, Bulgaria, Denmark, Estonia, Finland, France, Germany, Greece, Hungary, Israel, Italy, Malta, the Netherlands, Norway, Poland, Portugal, Slovenia, Spain, Sweden, Switzerland, United Kingdom. Blue circles represent locations of 202 weather radars that are part of OPERA. COST Member Countries currently not participating (orange) can potentially join this COST Action (see http://www.cost.eu/participate/join_action). By merging radar measurements and migration models, researchers have been able to explore some of the decision rules that govern movements of birds and insects and the impact that weather has on their flight paths. For example, huge numbers of birds or insects may travel great distances over the course of a night under suitable atmospheric conditions [15–17] and evidence is accumulating that even broad-fronted migratory movements are strongly spatially structured under influence of synoptic weather and geography [11, 15, 17]. Studies have also shown that during flight, birds and insects are typically not distributed randomly in the air but select specific altitudes with suitable environmental conditions [18–21]. Radar has also shed light on aspects of animal ecology that are very difficult to observe, such as the aerial roosting patterns of swifts [22, 23], strategies for crossing ecological barriers such as the Sahara , the escape response of birds to large scale human disturbance such as fireworks , and mapping the distribution of wildfowl resting sites over large spatial extents . Radar monitoring of animal movement and the use of radar data to develop movement forecasts serves a broad range of stakeholders. Aviation flight safety currently uses small and large scale radar for monitoring bird movements to reduce the risk of collisions between birds and aircraft, as well as using radar data to develop operational migration forecast models for the same purpose [27–29]. Radar is used to assess collision risks of birds and bats with wind farms [30–33]. It can play an important role in monitoring and predicting pest invasions , predominantly for agriculture. Radar data can also inform conservation strategies, by monitoring population densities at known roost sites of birds and bats [35, 36], studying changes in phenology in specific species , and identifying important stopover locations  or flyways . Weather radar products can be ‘contaminated’ with birds, bats or insects, reducing the quality of meteorological products, especially radial wind products  which are important for short-term weather prediction models. By improving the extraction of biological information from weather radar products the network will also improve the quality of operational meteorological products such as weather forecasts. Working with a network of operational radars will provide a wide range of opportunities for fundamental research, as well as diverse applications and stakeholders. Currently image mosaics calculated from volumetric weather radar data are already available for the OPERA network. ENRAM will actively work towards making such data and mosaics available for bird and insect migration studies. This will enable researchers to track movement in near-real time across borders, identify migratory flyways, quantify migration and set up long-term monitoring programs with infrastructure which is already largely in place. 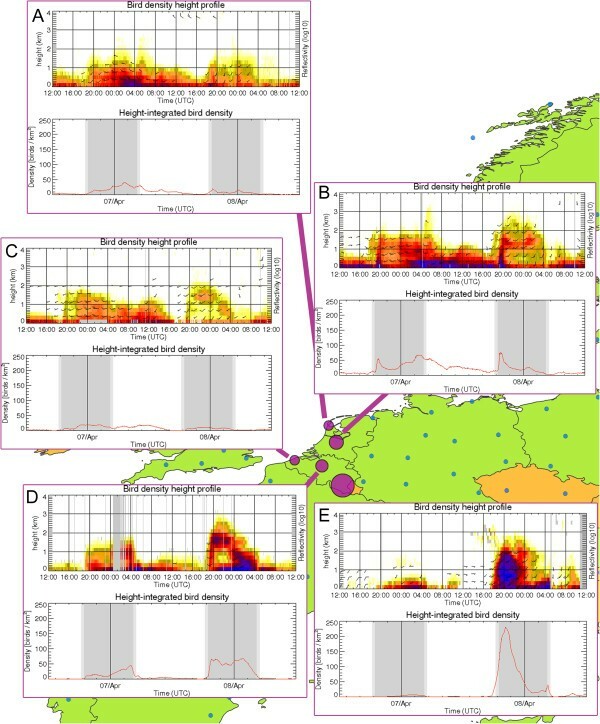 Although mosaics classified for biological targets are still not available, we provide an example of broad-front migration of birds on a night of peak migration in April 2013 as quantified on multiple weather radars in Belgium and the Netherlands (Figure 2). Data was processed from five different radars (De Bilt and Den Helder – the Netherlands, Jabbeke, Zaventem and Wideumont – Belgium) using a bird detection algorithm calibrated for passerine migration . On this night, height integrated migration intensity was greatest at the inland sites (De Bilt, Zaventem and Wideumont), with over 100 birds/km2 at Wideumont, and at an altitude of approximately 2 km above ground level. A migration layer is clearly visible at Jabbeke, De Bilt and Zaventem. Such layering events have been previously noted, predominantly in spring at single radar sites in temperate latitudes and can be ascribed to specific weather conditions, resulting in opposing winds at the surface and more supporting winds aloft . Mass bird migration observed on five operational weather radars. Nocturnal bird migration measured by two operational weather radars in the Netherlands (A. Den Helder and B. De Bilt) and three operational weather radars in Belgium (C. Jabbeke, D. Zaventem and E. Wideumont) on 7 and 8 April 2013 (for locations see purple circles on map, blue circles indicate other weather radars in the vicinity). The size of the purple circles represent the height-integrated bird density (birds/km2) on 8 April 2013 at peak migration. Colours in upper graphs of each subplot indicate bird density (number of birds/km3) with the wind barbs indicating the birds’ ground speed and flight direction, lower graphs in each subplot indicate the height-integrated bird density (birds/km2), grey areas in these graphs indicate periods between dusk and dawn. By combining multiple radars covering a large spatial scale, researchers can begin remotely monitoring migration at the scale of synoptic weather systems. Gaps between radars can be filled with spatially explicit simulation models [15, 34, 41] and mismatches between models and measurements can be used to improve our understanding of the responses of animals to weather and topography as well as study their orientation capacity in heterogeneous environmental conditions. ENRAM will work towards integrating information from complementary methods of measuring and modelling the distribution and movements of organisms, such as visual observations, individual tracking and simulation modelling. Such an integrated approach will enable researchers to follow populations of different species across the continent, quantify the movement of aerial biota at the continental scale, understand behavioural strategies of different taxa, the factors that drive emerging patterns in space and time at the population level, and the longer term consequences of the response of individuals to the environment, for individual fitness, population dynamics and ecosystem functioning [42–44]. We expect that operational weather radars will become an increasingly important tool for continuous real time monitoring of movement patterns of flying organisms. By bringing together an interdisciplinary group of researchers, ENRAM will facilitate new monitoring programs and research, resulting in ecological insights and improved weather forecasting. Researchers from any of the participating countries are welcome to join future activities of this research network, thus expanding the potential for multinational collaboration. We hope ENRAM quickly becomes a vibrant multidisciplinary community, and similar initiatives to develop an interdisciplinary network are underway in North America providing excellent opportunities for sharing expertise across continents [12, 45]. The full Memorandum of Understanding and list of participating countries is publicly available on the e-COST website (http://www.cost.eu/domains_actions/essem/Actions/ES1305) additional information about ENRAM is available at http://www.enram.eu. The authors would like to thank everyone involved in the ENRAM network for discussions at earlier meetings held at the University of Amsterdam, Rothamsted Research and Institute of Avian Research, preceding the e-COST Action. The authors thank the Royal Meteorological Institute of Belgium for usage of the Belgian weather radar data and Robert van Versendaal, KNMI for assistance with Figure 2. We thank Phil Chilson and one anonymous reviewer for their feedback on an earlier version of this manuscript. The authors acknowledge the support provided by COST - European Cooperation in Science and Technology for the realization of this paper. The contents of this paper are the authors’ responsibility and neither COST nor any person acting on its behalf is responsible for the use which might be made of the information contained in it. Rothamsted Research is a national institute of bioscience strategically funded by the UK Biotechnology and Biological Sciences Research Council (BBSRC). JSB designed, coordinated and wrote the manuscript; all authors contributed to the manuscript and designing the network. All authors read and approved the final manuscript.